Weekly Mailbag: Is SmarterTravel in Southwest’s Pocket? Welcome to our new reader mailbag, where you can ask, and get answers to, your questions about travel in general or something you saw on SmarterTravel in particular. This week’s mailbag is being answered by Managing Editor Josh Roberts. Have at him! Q: Are You Funded by Southwest? We’re not funded by Southwest. We’re not blinded by its public image, either, which has obviously been very carefully crafted by the airline and its “no fees” advertising campaigns. 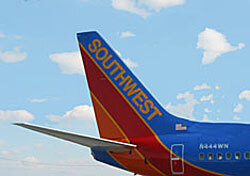 But that doesn’t mean we don’t appreciate the positive effect that Southwest has on air travel. It really can’t be ignored. Have you heard of the “Southwest effect”? It’s the resulting across-the-board price drop on flights when Southwest enters a new market and forces its competition to lower their prices in order to keep up. We see a microcosm of it just about every week when Southwest announces its weekly “Click ‘n’ Save” deals on Tuesdays and competing airlines (American and Delta, to name two) quickly match the sale prices. These are the fare wars we report on, and they’re good news for everyone—even those loyal to other carriers—because they keep prices down across multiple airlines. We compare actual prices in every deal report we write, and Southwest frequently performs well in that area (and that’s not even counting its free-checked-bags policy). Unfortunately, the reverse of the Southwest effect was in evidence last week on the Pittsburgh/Philadelphia route. When Southwest stops flying between the two cities in January, US Airways plans to increase the cost of a round-trip flight from $118 to $698—a shocking 600 (edit: 500) percent price jump. Why? Because that’s what the market will bear without low-cost competition. Without Southwest, we’d see a lot more stories like that in cities around the country. So when you see a deal report from SmarterTravel informing you that Southwest has initiated another fare war, understand that it’s not just Southwest’s passengers who benefit. It’s everyone. And they’re not paying us to tell you about it. Q: Where Are Your Last-Minute Airfare Newsletters? The last-minute weekend fares you used to see on SmarterTravel every week are still here! They’ve moved around a bit, though. We have consolidated the fare listings into a more thorough database of Departure City Fares, which now include both weekend flights and a list of the lowest-priced flights on thousands of routes as reported by the fare analysts at our sister site, Airfarewatchdog. Follow the link above, select your preferred departure city, and look for fares marked “W” (for weekend) in the resulting list. Other fare categories include domestic, international, new, and unadvertised. Among the many benefits of arranging the fares this way is that we also display nearby departure airports. So, say you live near Boston—in which case, sorry about the Red Sox this year—we’ll also show you flights departing from Hartford, Manchester, Providence, and Worcester. Check the site on Tuesdays, Wednesdays, and Thursdays for the most up-to-date weekend fares, or subscribe to our free Departure City email alerts to have them automatically sent to you each week. Q: What Happened to Your Coverage of General Travel Topics? That’s it for this week. Thanks for reading, everyone. If you have a question or comment you’d like to share, please do so in the space below, or send us an email at editor@smartertravel.com.